So you think your normal turn-signal lights are enough to ensure safety? Think again. What about those vehicles which are in your blind spots? How are they to know when you are going to barge into their lanes? The answer to all these and some more questions is the TurnSmart Mirror System. 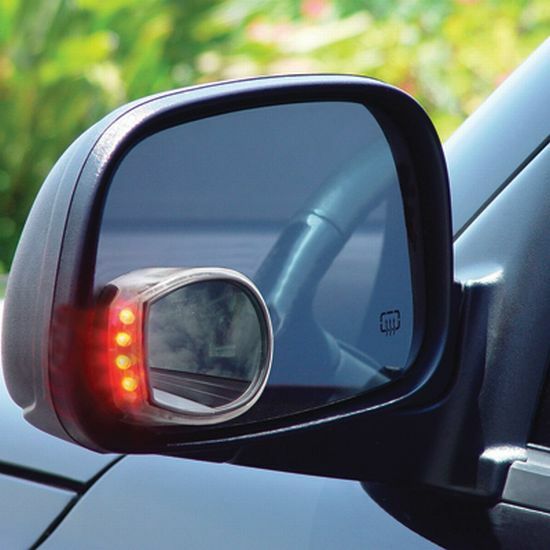 These small wide-angle mirrors attach to the regular side view mirrors and the blinking lights work in addition to the normal turn-signal lights. These are pretty easy to install and are solar powered. The universal kit attaches a couple of lights to your existing mirrors using a permanent double sided-tape while the transmitter attaches under rear bumper or in trunk. The lights are brighter than most tail lights thereby attracting more attention. The kit includes: Mirrors, Permanent Double Sided Tape, Transmitter, 72 inch pre stripped wires, Zip Ties to Secure Transmitter, Posi Tap Screw on Connectors, Test Light, and Bonus Quick Charger cigarette lighter adapter. And all these can be yours for $149.95. And just donât forget, you canât put a price on your safety. MPlayer by iRiver, a cute music player!